WASHINGTON, DC--(Marketwire - Feb 10, 2012) - Stepping away from the hectic pace of everyday life for a lover's holiday with that special someone is easy this Valentine's Day with romantic Washington, DC hotel deals like the one offered by Washington Marriott. This Georgetown DC hotel package starts with deluxe overnight accommodations and then pampers guests with a bottle of sparkling wine, complimentary breakfast for two adults and free parking. With rates starting as low as $169*, this is an exceptional choice among hotel packages in Washington, DC and an ideal way to help Cupid on his way this Valentine's Day. The spacious guest rooms at Washington Marriott include Marriott Revive® bedding, complete with down comforters and 300 thread-count linens. Room service is a standard feature along with a coffee maker and tea service, a flat screen LCD TV with premium movie channels and pay-per-view movie options. 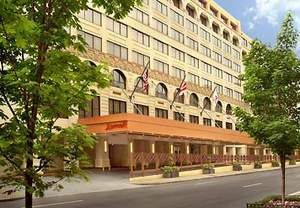 A premier choice among Georgetown hotels in Washington, DC, the Washington Marriott is conveniently located in the heart of the city and near many popular Washington, DC attractions. Guests don't have far to go to experience exceptional dining options, as creative American cuisine in a casual atmosphere is offered in The Atrium Restaurant, while cocktails, fine wines and a variety of appetizers and comfort foods are served daily in the hotel's Court Lounge. For those looking to "step out" for the evening, some of Georgetown's finest restaurants are located within walking distance. Booking a lover's escape is easy, as the Celebrate Valentine's Day package is available through February 14, 2012, and reservations may be made simply by visiting the hotel website at http://www.marriott.com/hotels/travel/waswe-washington-marriott/ and clicking on "Check Availability" or by calling 1-800-228-9290 and using promotional code ROM. *Rates are per room per night and valid seven days a week through 2/14/12 based on availability at the time of reservation. Offer does not apply to groups of 10 or more rooms and may not be used in combination with any other discount or promotion. Advance reservations required. Please visit hotel website for additional terms and conditions. Washington Marriott is an established landmark amidst the hustle and bustle of Washington, DC, allowing guests to enjoy the heart-beat of this remarkable city while resting comfortably in well-appointed guest rooms and hotel suites overlooking the tree-lined streets below. Attentive service and gracious amenities are standard at Washington Marriott, which also offers more than 12,000 square feet of newly renovated event space. Boasting state-of-the-art facilities, dedicated event managers and professional catering, this well-defined hotel is an ideal choice for group conferences, corporate meetings and elegant social gatherings. Stepping away from the hectic pace of everyday life for a lover's holiday with that special someone is easy this Valentine's Day with romantic Washington, DC hotel deals offered by Washington Marriott.